Hildegarde Seidel Hower, aged 98, died on 27 August 2018 at the La Plata Nursing Home in La Plata, MO. She was born on December 12, 1919, in the village of Kleinweissensee in East Prussia, the youngest child of Adolf and Esther Holtz. The family immigrated to Reading, PA, in 1925, where Hildegarde attended Reading High School and the McCann School for Business. She is survived by her daughters Linda A. Seidel (Kirksville, MO) and Deborah L. Seidel (Seattle, WA); her stepson Gregory S. Hower (Lebanon, PA); and her grandson Robert S. Costic (Washington, DC). 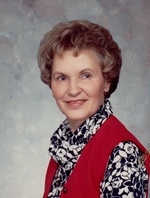 Her husband of nearly 24 years, Harold D. Hower (Lebanon, PA) died in 2013. Quiet and self-possessed, with a radiant smile, Hildie (as she liked to be called) was a working mother during most of her 35-year marriage to Richard D. Seidel (originally of West Reading, PA), helping to support the family by serving as a bank teller for many years. She enjoyed playing the violin (in high school), riding horses (in her twenties), singing in her church choir (most of her life), ball-room dancing (with Harold Hower), and (more recently) bird-watching. A simple graveside ceremony will be held at the Forest Llewellyn Cemetery in Kirksville, MO, on September 24th. To send flowers to the family of Hildegarde Seidel Hower, please visit our Heartfelt Sympathies Store.